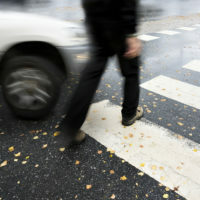 “More pedestrians are being killed by automobiles in America than at any time in more than 25 years,” Rebecca Bream reports in patch.com, citing the latest Governors Highway Safety Association report on highway safety. Again this year, nearly 6,000 pedestrians were killed by automobiles right here in Indiana, putting our state at a ranking of 12th highest in the U.S.
Stay calm and move out of the street to a sidewalk or driveway. Keep the driver there and ask witnesses to stay, too, until the police arrive. Snap pictures of the car, the plates, the intersection, the street signs, yourself. Write down (or ask a bystander to do it for you) the driver’s information. When the police arrive, make your voice heard. Seek medical attention, documenting all medical expenses. Call the driver’s insurance company and open a claim. Why do vehicles hit pedestrians? “If the accident occurred because of someone else’s negligence,” says alllaw.com, “you’ll want to keep all your legal options open.” Indiana is a “modified comparative negligence” state. That means that you can recover damages from another party, but those will be reduced by a percentage that corresponds to your own share of fault. And, if your share of fault for the accident exceeds 50%, you won’t be able to recover anything at all. Insurance can help compensate for your loss, but when that simply isn’t enough, Ramey & Hailey is there to see you get the recovery you deserve. If you or a loved one has been by a vehicle, we can help make your voice heard.